"You won't make it off this mountain without me." Stranded in the harsh Alaskan wilderness, Eric Desmond (Dylan Walsh) faces a difficult split-second decision. 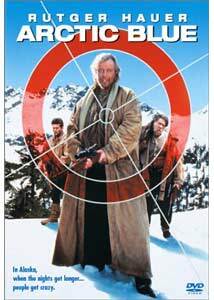 Ben Corbett (Rutger Hauer)—a violent, slightly crazy trapper—has slipped in the ice while trying to escape from him. Eric works as an ecologist for the oil company, and a series of unpleasant events have placed Corbett under his supervision. This trapper has killed several people, including one of Eric's friends. Should he save this disturbing figure or leave him to his fate? Regardless of his choice, things won't become any easier for him. Ben's henchmen are on his trail, and they're closing in on an innocent man who is just trying to do his job. Rutger Hauer (Blade Runner, Ladyhawke) gives an impressive performance that carries Arctic Blue—an uneven story about two men with far different ideals forced to work together against the tough environment. Ben loves the open landscape and feels at home here, especially after the saddening death of his wife years earlier. Life has lacked the same meaning for him since that moment, and his only respite is the complacency of the Alaskan wilderness. This character is a less grizzly counterpart to Stellan Skarsgard's Randbaek in Zero Kelvin—a tougher, more complex Norwegian story of the horrors of a cold environment. Similar to Randbaek, Ben's sorrow has driven him further from society, which has led him to thoughtless violence. On the other hand, Walsh's Eric moved to Alaska from Los Angeles, and he lacks the animal instincts of his counterpart. Living in a well-furnished trailer with his attractive wife Anne Marie (Rya Khilstedt), Eric is the outdoor type for the new generation. This immediately brings him into conflict with Ben, who constantly tests the younger man's will to discover the depths of his inner strength. Everything should have run fairly smoothly. Eric has decided to fly Ben to Fairbanks aboard his small Cessna aircraft. While in the air, his captive sits within plain sight in handcuffs, and they're progressing nicely. Unfortunately, Ben easily sabotages the plane and crashes them in the middle of the snow. After a dull opening, it seems that the story is now ready to start moving. It is too bad that Ross Lamanna's (Rush Hour) script lacks the bite and emotional complexity necessary to make their struggles interesting. The scenes following the crash mirror the usual survival film moments without much invention. Luckily, Hauer utilizes his considerable presence to keep Ben intriguing and mysterious. His extreme physicality gives him the upper hand even while placed in shackles. The character offers plenty of promise, but it's underwritten and only stays alive through Hauer's efforts. Dylan Walsh suffered terrible miscasting in Michael Crichton's Congo disaster, and his role is only a slight improvement in this case. Eric's motivations to escape Los Angeles never really make sense, and his character's perseverance is never totally believable. The blame should fall mostly on Lamanna's script, which has Walsh uttering ridiculous expository lines instead of more realistic words. Kihlstedt actually does pretty well as Anne Marie and doesn't overdo the "city girl in the wilderness" idea. In one of the best moments, she listens as Ben discusses his troubling past. This quick, emotional scene works better than most, and it reveals a deeper story hidden beneath this simple feature. Arctic Blue offers yet another version on the original High Noon story of a man fighting alone against a deadly enemy, while the townspeople and local politician refuse to stick their neck out for anyone. However, this story differs because of the variation in the Ben Corbett character. He doesn't seem particularly fond of his henchmen, and actually seems to like Eric. This contradiction never plays out successfully and leads to a clumsy shoot-out ending. While far from a total failure, the ultimate product fails to inspire and falls into the more conventional pile of mediocrity. Image Transfer Review: Arctic Blue contains a fairly blurry full-screen transfer that contains few notable images. The picture often is television-quality and lacks the usual clarity of digital video. These problems are unfortunate because they lessen the impact of plenty of gorgeous scenery. The foreboding, white glaciers and dark pine trees present an imposing sight that would have increased with a better transfer. Instead, the sparse landscape is watchable, but nothing special, and it reduces the overall impact of this feature. Also, the picture contains a decent amount of blemishes that even further hinder the production. Audio Transfer Review: This disc contains a 2.0-channel Dolby Surround transfer that works well enough to present the sound effects of the Alaskan wilderness. In the opening credit sequence, Eric sprints through the cold, blustering winds and rain, and the audio nicely conveys the chilling atmosphere. During the feature, the dialogue is clear and understandable, and the noises create the proper tone for the story. However, this track lacks the power and complexity necessary to raise the film to greater heights. Instead, the sounds remain mediocre and convey the scenes in only an adequate manner. Extras Review: Arctic Blue includes a typical feature-length commentary from director Peter Masterson. Throughout the presentation, he utilizes a dry, monotonous tone that exudes little excitement or interest. Much of the material is obvious plot summary that is easily evident to anyone paying much attention to the film. Masterson does offer some basic information about the actors and the production, but most of it falls short of anything compelling. I did find it interesting that the entire film was shot in and around Vancouver, not Alaska. This dull track will provide some interest to fans of the movie, but it probably will bore everyone else. This disc also contains the theatrical trailers for this feature, Striking Distance, and the Replacement Killers. The last one comes in a 1.85:1 widescreen version, while the others appear in the full-frame format. The preview trailer and cover art for Arctic Blue appears to promise a predictable action B-movie set in the Alaskan wilderness. Instead, the story focuses more on dramatic elements and the relationship between Ben Corbett and Eric Desmond. This leads to an intriguing concept, but the execution and much of the dialogue is poor and too simple. The Western-style ending could have provided some much needed tension, but it also becomes too predictable. Rutger Hauer's performance keeps the story mildly interesting, but it's not enough to save the overall product.